Make it a romantic get-away or bring the whole family. Eastwood and Provincetown is a special place for singles, couples, and families. Eastwood is a relaxing place. You may eat in your unit, bbq on premises or go into town to enjoy the many wonderful gourmet restaurants. Stay pool side or go to the beach. Walk through town and see a wide variety of shops and art galleries. Visit the famous Pilgrim Monument or one of several lighthouses in the area. Rent a Kayak and explore the bay, take a boat on a fishing or whale watching expedition. Play golf , tour the dunes, or enjoy a sunset on the beach. Hiking or biking the fabulous trails in the National Seashore Park or around town is a favorite pastime for our guests. One bedroom units can accommodate four people. They have fully equipped kitchens, 1 & 1/2 baths, and linens are provided. Each unit has air conditioning and cable television. Studio units can accommodate two people. They have full kitchens and a full bath. and linens are provided. 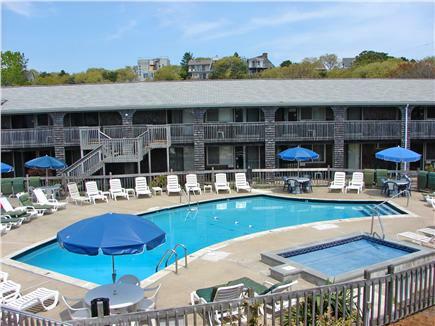 Each unit has air conditioning and cable television.